The InstaPump Fury Road PL is aesthetically appealing with its combination of classic and modern styles. Buyers are happy with their purchase as this sneaker is reasonably priced. This is a great option if one is looking for a sneaker that offers all-day comfort. Good combination of leather and textile materials for the upper. The Reebok InstaPump Fury Road PL is breathable. Decent traction on the rubber outsole. The black colorway is stylish and elegant according to reviewers. The foot slides inside the shoe with ease with the use of pull tabs on the tongue and heel. A very satisfied buyer said the white colorway is immaculate and awesome. This sneaker is nice to pair with skinny jeans. Walking with this sneaker feels good as it is cushioned and lightweight. A reviewer mentioned that the original edition of the InstaPump Fury is more comfortable than this one. One reviewer finds the toe box rather narrow. A collector who scooped a number of earlier InstaPump Fury versions said the Fury Road PL downgraded on its performance capabilities with the removal of the GraphLite plate under the midfoot. It retained the InstaPump Fury shoe’s familiar cut-out silhouette with a hint of elegance coming from its premium upper materials. The highlight of this sneaker lies on the Pump unit that inflates and deflates for a locked-down fit and vice versa. It is designed more for daily streetwear with the removal of performance-related technologies. This sneaker managed to turn heads for over two decades and will probably be an eye catcher still for many more years, given its ultra-modern, minimalist, and timeless design. The InstaPump Fury concept from the early 1990s was initially put aside as it is way too futuristic for its time, but the acclamations seem to outweigh those who describe it as a mutated pair of shoes. In fact, this seemingly Frankenstein-looking sneaker with a hodgepodge of technologies pieced all together is regarded as one of the coolest shoes created by Reebok. It evolved over the years with the multitude drops of variations such as the InstaPump Fury Road PL. Before the InstaPump developed gradually into an ultra-popular mainstream and fashion sneaker, it flourished on the court as a ball shoe with the same name minus the advanced design improvements on its upper. The original InstaPump dropped in 1989 was intended for basketball use. It was the first hoop shoe with the air bladder mechanism on the upper and lower tongue that can be inflated or pumped for a customized fit. This release was followed by the drop of the Pump Running Dual in 1991 that had a double pump tech on the medial and lateral sides. And the Pump GraphLite version came in 1992 that had an extra support and cushioning in the midsole. The radical makeover on the InstaPump was made just before the 1994 Olympics. It was during this time that the popular pump kicks initially received its most flamboyant silhouette with the release of an aptly named iteration, the Reebok InstaPump Fury. Designed by Steven Smith, the shoe’s black with red and lemony colorway called Citron literally screamed for attention. 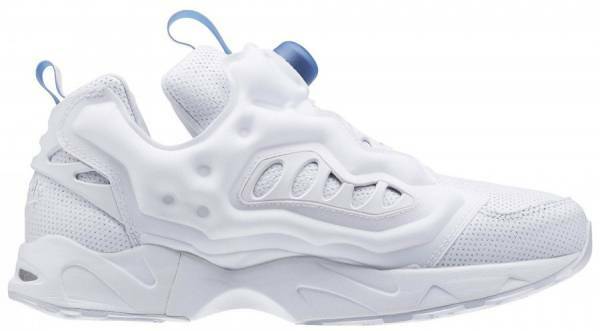 When the concept for the Instapump Fury was originally pitched to the marketing team of Reebok, Smith, along with former Vice President of Advanced Concepts Paul Litchfield, did not get an instant approval for the shoe. They were advised to create a blue, gray, black combo since the conventional colorway would likely sell over the neon silhouette. The design team’s persistence led to the birth of this mind-blowing shoe free of laces. This completely synthetic upper had several panels that emphasized the inflated air bladder innovation. It made use of the GraphLite technology of the previous model, where a plate made of carbon fiber is placed in the underfoot for arch support. It radically decreased the weight of the shoe while providing stability and support. The outsole incorporated the durable Hexalite cushioning unit with a honeycomb pattern, which meant to disperse the blow of impact to a bigger area than the polyurethane counterparts used in earlier releases. The InstaPump Fury may look bizarre for some, but this performance shoe earned its own cult following among sneakerheads. It became an instant celebrity with many avant-garde artists seen endorsing the silhouette, such as singer Bjӧrk who supported its futuristic look, and Chanel creative director Karl Lagerfeld who integrated the shoe in the 2001 fashion show. In the coming years, the Reebok InstaPump Fury Road variations hit the streets which kept the same premium materials on the upper yet gradually stripped off elements that made it into a performance shoe back in the day such as its GraphLite technology. Camo prints, speckled soles, and multicolored uppers are among the few renditions made as the shoe as it stays to be a much sought blank canvas for creative minds. The InstaPump Fury Road PL, on the contrary, is more subdued with its classically styled upper which made use of premium leather. This edition gave emphasis on monochromatic hues to give it a timeless allure. Upon instant look, the InstaPump Fury Road PL is like a modern sneaker with a geometrically designed upper. For this iteration, Reebok veered away from the usual striking and attention-grabbing colorways as seen in the earlier versions of the InstaPump Fury and the brand went for a classic style. This sneaker’s timeless quality as depicted in its singular colored upper that easily blends with practically any clothes. This version retained the original silhouette of the InstaPump Fury with an ultra-modern finish. This sneaker turns any simple attire elegantly fashionable. The laceless Fury Road PL, like its earlier Reebok InstaPump siblings, is built with the popular air bladder system on the tongue that inflates when pumped for a lockdown and secure fit. There are inflatable compartments on the upper that surround the foot and receive air from the same Pump device. The collar and tongue are padded for the needed support and cushioning in those areas. This sneaker is available in men’s sizes that range from 4 to 13 US. It generally runs true to size and comes in medium width. The cut-out silhouette of the Reebok InstaPump Fury Road PL paired with its seemingly fragmented midsole has surprisingly drawn legions of followers for its oddity. It’s a fashion statement by itself that generally calls for attention, a kind of style that easily attracts those with an upbeat personality. Not to forget, the inflatable air Pump bladder built on the tongue and upper that locks the feet down making this shoe completely laceless. The Reebok InstaPump Fury Road PL is constructed with an injected molded EVA midsole for shock absorption. The process of creating one leads to zero wastage as this method utilizes a precise amount of EVA compound. The outsole is made of hard-wearing rubber material. It has a molded sockliner that offers additional padding. The Hexalite honeycomb design built in the outsole distributes shock over a large region.